NASHVILLE, Tenn. - Little Jimmy Dickens, the longest-running member of the Grand Ole Opry, has died. He was 94. Dickens died at a Nashville-area hospital of cardiac arrest after suffering a stroke on Christmas Day, the Opry said in a statement. Dickens joined the Opry in 1948, and last performed there on Dec. 20, 2014, his birthday. As part of the celebration, he sang "Out Behind The Barn" and delivered his trademark comedy. Dickens had expressed his love of performing at the Opry. "I look forward from one weekend to another to get back out on the stage of the Grand Ole Opry and try to entertain people who have come from miles and miles and state to state to be entertained with country music," he said. "We do our very, very best to give them a good presentation and hope that they enjoy themselves." Dickens was elected to the Country Music Hall of Fame in 1983. "The Grand Ole Opry did not have a better friend than Little Jimmy Dickens," said Pete Fisher, Opry vice president and general manager. 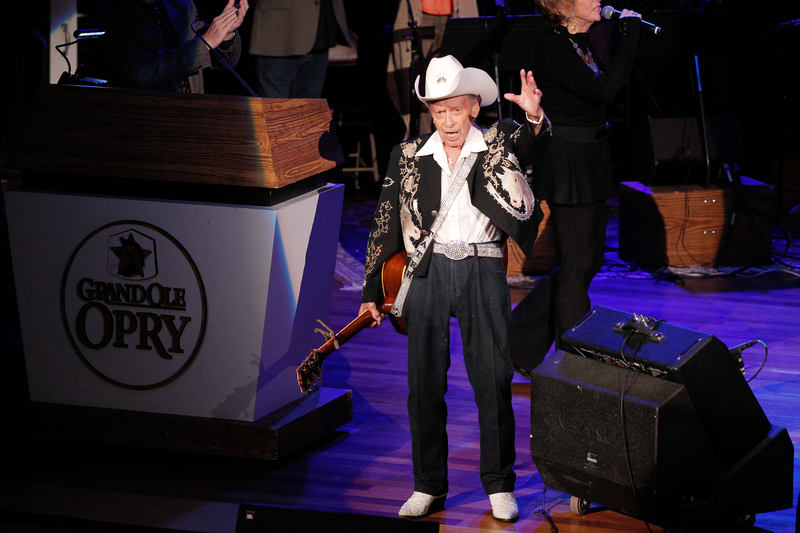 "He loved the audience and his Opry family, and all of us loved him back. He was a one-of-kind entertainer and a great soul whose spirit will live on for years to come." Dickens was known for such hits as "May The Bird Of Paradise Fly Up Your Nose," "Take An Old Cold Tater (And Wait)," "Country Boy" and "Out Behind The Barn." He is survived by his wife Mona Dickens, married in 1971, and two daughters, Pamela Detert and Lisa King.